The American Chiropractic Association Council on Nutrition is a body of chiropractors, who are also members of the American Chiropractic Association. They are committed to the growth, development and research of the science of Chiropractic and Nutrition, as a healing art for improving patient outcomes. This approach to preventive medicine advances the integration of clinical nutrition with the practice of Chiropractic. The ACA Council on Nutrition promotes research in nutrition and sponsors an annual symposium. It also extends courses in nutrition to chiropractors to satisfy their continuing education requirements from all applicable states, through accredited colleges. 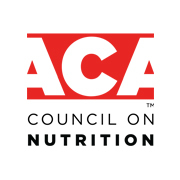 The ACA Council on Nutrition gathers, correlates and disseminates knowledge and information about nutrition through its bi-monthly newsletters and quarterly journal, Nutritional Perspectives. We are dedicated to our member chiropractors, the profession, and the public. Join today and be part of the wave of healing through preventive medicine. The ACA Council on Nutrition continues to grow while encouraging professional consultation with other chiropractic professionals. We encourage participation in and promote a more advanced knowledge and use of nutrition in the practice of chiropractic. The Council makes application to all applicable states through an accredited college to achieve educational credits at each annual seminar. DACBN educational credit hours are also applied for as well as granting DCBCN hours. The symposium offers the exchange of ideas and the interaction with speakers and nutritional companies with national standing. Come explore the latest version of our journal, Nutritional Perspectives. This quarterly publication also offers advertising opportunities for companies to promote their nutritional products and is available only to our members.